at finding jobs worldwide. Let’s discuss more than 20 places you can start with. Have any resources you want to share? Link them in my comment section below! This is one of the most reputable services that provides flexible jobs for anyone around the globe. No worries, all jobs are carefully selected for legitimacy. You'll find jobs from reputable sites such as Aetna, Xerox, Amazon.com, American Express, Convergys, and many more. Upwork is one of the largest freelance sites online where people looking for work at home jobs can find thousands of jobs in all categories imaginable. Jobs are posted by clients from around the world. Clients can choose to work with freelancers from their preferred locations. 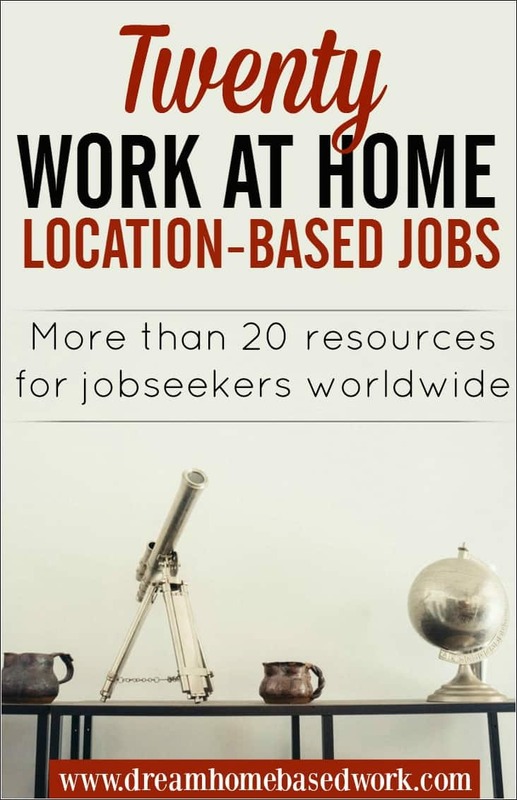 Freelancers or people looking for work at home jobs can search jobs by location. Freelancers from around the world can find jobs on this great site whether they are from the US, Canada, UK, Ireland, Bangladesh, Kenya, the Philippines or other countries. This is one of the largest freelance sites where thousands of different types of freelance jobs are posted by clients from around the world. Freelancers can search for jobs by location. You need to create a profile before you can apply for jobs. This is another reputable freelance site where you can search for location-based work at home jobs. You apply for jobs by bidding on them and submitting a proposal. This is a huge site for people from around the world looking for work at home jobs. Holly Hanna, the founder of the site, published an article about “Huge List of Work-at-Home Jobs by Location” targeted for people in the United States. You will find jobs listed by state in this article. The site is a great resource for freelancers and people in general looking for job search resources by location in and outside of the US. It is a great site that provides tons of useful information about work at home jobs by location. Anna, the owner of the site wrote an article “Work at Home for Canadians ”. You can check out another article entitled “Where to Look for Worldwide Work at Home “. This popular informational site has a few articles that list worldwide work at home job listings for people who live inside or outside the US. One popular post on this site is “Global Work-at-Home Jobs“. About.com has many links to sites or jobs designed for people living in various countries looking for home-based jobs online. My site is dedicated to providing all the information you need to know about finding legitimate work at home jobs online and offline. 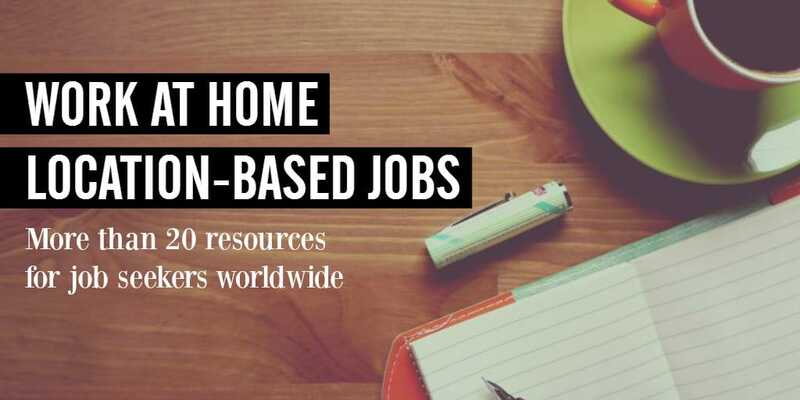 The site lists work at home jobs that are open to home-based workers worldwide. Here is a great post entitled “International Work at Home Jobs and Online Money Making Ideas ”. This is a forum site that has an entire section for international work at home job leads. You must register first before you can have access to the main site. People looking for work at home jobs online can find jobs or employers by location on this website. This site provides useful work at home job posts and tips and information on how and where to find legitimate work at home jobs online. You will be able to find out which jobs are available for people from around the world as you read the job posts on this site. This is a German freelance site where freelancers can create their accounts to apply for various types of freelance work at home jobs. This is a freelance job site where freelancers can find projects and clients can choose freelancers to work with. Jobs are posted in many different categories. This is a Latin freelance site where all kinds of freelance jobs ranging from administration to call center and construction to marketing, and medicine. This is a French site that also has a forum for freelancers. Freelancers post their resumes on the site. Clients can browse through the resumes and choose to work with their preferred freelancers. This is a freelance site where clients from many different countries in South America post a wide variety of freelance and work at home jobs. The parent site has country-specific sites for freelancers and clients from Argentina, Chile, Ecuador, Mexico, Panama, Peru and Venezuela. Freelancers create their profile first before they start applying for jobs. It is a Swedish job site that lists project-based jobs in IT and programming fields in particular. This is a premium IT job site based in Romania where people can find full time, part time and freelance positions. It is a Turkish job site where all kinds of IT, programming, and web development jobs are available. Users looking for jobs can create their profile and highlight their skills on the site. This site offers beginner Transcription jobs to people from around the globe. All you need is a computer, reliable Internet, and the ability to transcribe audio and video in any of the languages that we support. No prior experience is needed to apply. There you have it- plenty of resources for those looking for work inside and outside the United States. Between flexible jobs and freelance gigs, there's a number of ways to make money from any location. Don't forget to connect with me on Facebook and YouTube! And as always, if you have any questions or comments, feel free to email me directly at [email protected] Looking forward to hearing from you!